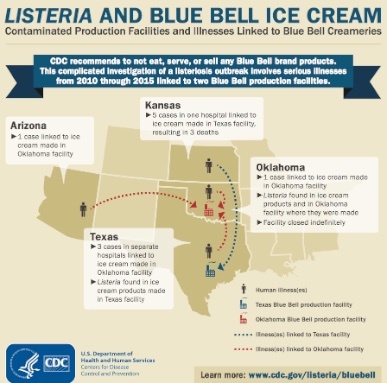 The Centers for Disease Control and Prevention (CDC) has updated its investigation into the multistate outbreak of listeriosis linked to Blue Bell Creameries ice cream products. Ten people from four states have been sickened so far. Three people have died, and all ten people have been hospitalized. The CDC has produced an infographic about the outbreak, which traces the illnesses and the facilities where products that made people sick were made. Listeria was found in Blue Bell ice cream products and in the Oklahoma and Texas facilities where they were made. Blue Bell recalled all of its products on the market made at all facilities on April 20, 2015. That recall includes all of its ice cream, frozen yogurt, sherbet, and frozen snacks, because they may be contaminated with Listeria monocytogenes bacteria. CDC recommends that consumers not eat any Blue Bell brand products on the market, and that institutions and retailers do not serve or sell them. Several strains of Listeria monocytogenes are involved in this outbreak. The outbreak goes back over the past few years to 2010, according to the government. The symptoms of listeriosis include flu-like symptoms such as fever, stiff neck, muscle aches, vomiting, nausea, and diarrhea. Pregnant women may only have a mild illness, but listeriosis can cause miscarriage and stillbirth. If you ate Blue Bell products and have experienced these symptoms, see your doctor and tell her about this outbreak.